St George Dragons vs. North Shore Bombers – Olds Park on Saturday, May 19, 2018. The North Shore Bombers have broken away from the pack to be the runaway leaders. But although North Shore have been successful in the last few seasons, Olds Park has been something of a hoodoo ground for them, and they went into Saturday’s match against the St George Dragons having not won there for ten years. The St George also had cause for optimism of pulling off an upset, having won their last two games after a slow start to the season. But whatever hopes St George had were soon dashed. From the start, the North Shore Bombers put on a display of ruthless efficiency to shut the home side of the contest, and the game was over almost as soon as it started. There were Bombers at the bottom of every pack, midfielders were presenting unchecked options at will and there were a multitude of forwards making leads at every opportunity. It was an exhibition, a talented and well-drilled side showing off their best quality football. And the scoreboard reflected what was happening around the ground as North Shore landed eight goals to one to lead by 46 points at quarter time. It was a similar story in the second quarter, as the game continued in the same lopsided manner as the first term. St George were left to chase the game, as North Shore dominated possession around the ground and controlled play as virtually every contest ended with a North Shore player in control of the ball. 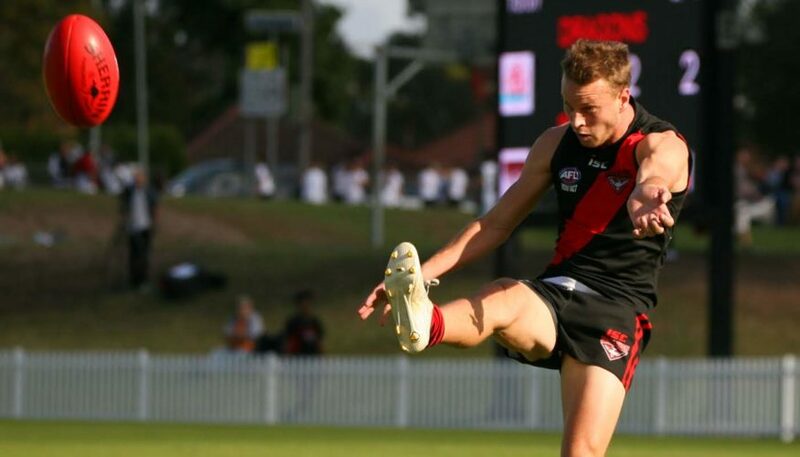 The quarter would see North Shore score five goals to one, and it was an energised North Shore team and a shell-shocked St George side that returned to the rooms at half time with the Bombers holding a 73-point lead. Already the game was safely won, and the North shore Bombers didn’t look quite as dominant in the third term. Not that they needed to be. A few attempted trick shots that didn’t quite go off, and some missed attempts, but you couldn’t be too critical of the Bombers having already safely wrapped up the win that kept their undefeated status intact. And around the ground the Bombers were getting the lion’s share of possession, and incursions into the St George 50 metre line were still rare. A quarter of three goals to one in favour of the Bombers saw them with a 90-point lead at the last change. The sting had largely gone out of the contest, but the lure of the three-figure margin was still there for the Bombers. This was quickly achieved, and although the Dragons pulled back a few late goals there was no doubt this was the Bombers’ day. A quarter of four goals to three was enough for the Bombers to take the game by 101 points, and end the Olds Park curse. The Bombers were sharing the goal-kicking love around, with 13 of their number drawing twin flags from the goal umpire. Matt Varjavandi was the standout up forward with four goals, while around the ground myriad possessions from Ned Campbell, Jimmy McKenzie and Will Taylor were pivotal in getting the North Shore engine machine running. Seven wins from seven starts, an imposing percentage and two games clear of the rest of the field. North Shore’s 2018 is off to a flyer. Alex Wynn, Maxwell Jeffrey and Harry Hunt tried hard all day for St George. But this wasn’t the sort of day the Dragons were hoping for. Two wins and five losses, and this result further dents their already low percentage, and the Dragons are languishing in ninth spot, two games plus plenty of percentage out of the five. Still a long way to go, we’re not even half way yet. But the Dragons have plenty of work to do to get themselves back into finals contention.